With Ash Wednesday but a week away, one annual mystery of Roman Lent is solved: the Curia's lone senior African, Nigerian Cardinal Francis Arinze, will lead this year's Lenten Retreat for the Pope and his top aides. In December, the 76 year-old retired as prefect of the Congregation for Divine Worship and the Discipline of the Sacraments, leading the Holy See's interreligious dialogue efforts for two decades before his 2003 appointment as the global church's Worship Czar. 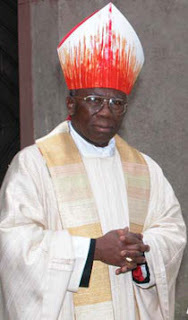 Best known for his colorful interventions in the public arena, Arinze -- a convert ordained to the episcopacy at age 32 -- was named a cardinal in 1985. While the invitation to preach the papal Lenten Retreat has been a venue for prior pontiffs to showcase their preferred papabili -- both Cardinals Karol Wojtyla (1976) and Joseph Ratzinger (2002) led the week of conferences prior to their elections to Peter's chair -- Benedict XVI has conspicuously avoided the custom, entrusting the task to cardinals already retired; last year, the octogenarian Scripture scholar Albert VanHoye SJ preached the exercises, following two former heads of Italy's major sees, Cardinals Marco Cé of Venice in 2006 and Giacomo Biffi of Bologna in 2007. Always taking up the first full week of Lent, this year's retreat begins on the penitential season's first Sunday, 1 March; Arinze's chosen the theme "The Priest Encounters Jesus and Follows Him" as the basis for his meditations. With curial business customarily curtailed for the exercises' duration, Benedict will depart Rome for his first visit to Africa ten days after the retreat's close.